The focus of the Hydro-International July-August 2017 issue is Unmanned Systems. You'll find articles on this subject in addition to the regular columns. Do you like it better to have the magazine in your hands? Get the print edition! Page 19-23: The 2,708 metre high Poás volcano is one of the most active volcanoes in Costa Rica, located 35km northwest from the capital San José. This stratovolcano contains a 300m wide crater lake filled with natural, very acidic, hot concentrated chloride-sulfate brine, the Laguna Caliente (‘hot lagoon’). Knowing the volume and bathymetry of the lake is crucial in monitoring and predicting the behaviour of this active volcano, but there is no recent bathymetric data available. To map the lake bathymetry of this very hostile environment we developed a cheap and portable, sonar equipped Unmanned Surface Vehicle (USV) and surveyed the lake with it. Read now. Page 16-18: Coastal communities around the globe are seeking better ways to understand and manage regional ecosystems. They depend on the ocean to sustain economic opportunities, ensure food security, and safeguard fragile environments and species. For harvesters, scientists and government organisations in Nova Scotia, Canada, timely, accurate, comprehensive data on movements of valued species is essential for designing effective fishery management regimes. Read now. Page 24-27: The wave-propelled AutoNaut unmanned surface vessel (USV) completed a short trial off the south-west coast of England to monitor the water quality by a sewage outfall. AutoNaut demonstrated its ability to reliably operate in shallow waters whilst also recording and transmitting data. A suite of sensors aboard the USV worked in conjunction with satellite data from synthetic aperture radar (SAR). Analysis indicated that the seawater close to the outflow was not negatively affected. The combination of technologies is pioneering for the application and the trial highlights the potential of this innovative approach to conduct long-term marine monitoring – including the reduction of costs and risks relative to conventional methods. Read now. 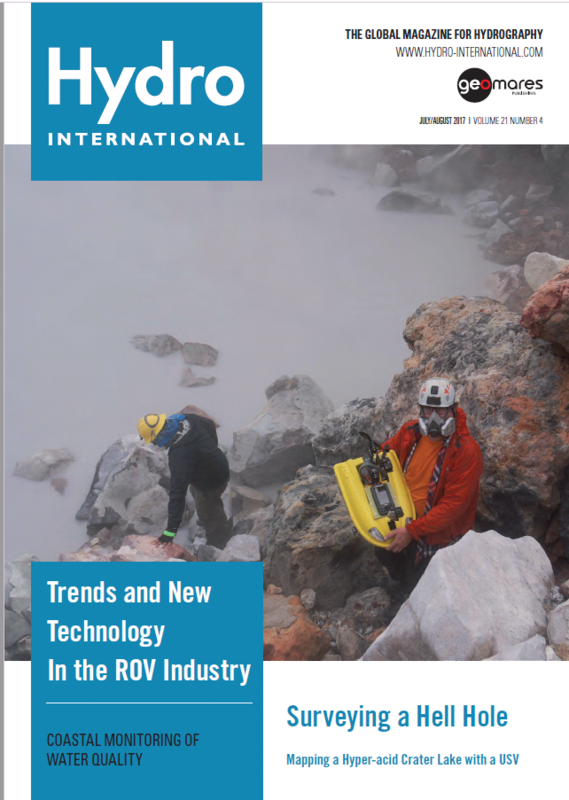 Page 28-31: Over the past few years, the requirements for ROV support in the oil & gas sector has been hampered by the downturn in the sector. However, the continued investment in renewable energy has provided opportunities for manufacturers to continue their R&D projects to create the next generation of ROV systems. Read now.